Criticism of Buddhism has taken numerous different forms, including that its practitioners act in ways contrary to Buddhist principles or that those principles systemically marginalize women. There are many sources of criticism both ancient and modern, stemming from other religions, the non-religious, and other Buddhists. Theravada Buddhism has been criticized because it treats women, particularly women monks, as inferior to men. Most schools of Buddhism have more rules for bhikkunis (nuns) than bhikkus (monk) lineages. Theravada Buddhists explain that in the time of the Buddha, nuns had such problems like safety if they were to be ordained the same way as monks who traveled around in the forest and between cities. Thus, more rules have to be created for nuns, for instance: nuns are forbidden to travel alone. The most criticised doctrine is found in Amida Buddhism’s vow 35: "The Buddha established the Vow of transformation [women] into men, Thereby vowing to enable women to attain Buddhahood". Earlier limitations on attainment of Buddhahood by women were abolished in the Lotus Sutra which opened the direct path to enlightenment for women equally to men. According to Nichiren "Only in the Lotus Sutra do we read that a woman who embraces this sutra not only excels all other women but surpasses all men". In medieval Southeast Asia, there were a number of Buddhist states, including the Pagan Kingdom, the Sukhothai Kingdom, and the Kingdom of Polonnaruwa. In Sri Lanka especially, modern monks frequently involve themselves in nationalist politics. These Buddhist nationalists have been opposed by the Sarvodaya Shramadana Movement, a self-governance movement led by the Buddhist A. T. Ariyaratne and based in Buddhist ideals, who condemn the use of violence and the denial of Human rights to Tamils and other non-Buddhists. Maung Zarni, a Burmese democracy advocate, human rights campaigner, and a research fellow at the London School of Economics who has written on the violence in Myanmar and Sri Lanka, states that there is no room for fundamentalism in Buddhism. "No Buddhist can be nationalistic," said Zarni, "There is no country for Buddhists. I mean, no such thing as ‘me,’ ‘my’ community, ‘my’ country, ‘my’ race or even ‘my’ faith." Violence in Buddhism refers to acts of violence and aggression committed by Buddhists with religious, political, and socio-cultural motivations. Buddhism is generally seen as among the religious traditions least associated with violence, but in the history of Buddhism there have been acts of violence directed, fomented or inspired by Buddhists. Friedrich Nietzsche, through Schopenhauer whose pessimism was highly influenced by Buddhist philosophy, interpreted Buddhism as a life-negating philosophy that seeks to escape an existence dominated by suffering. According to Omar Moad, Nietzsche misunderstood the meaning of Buddhist doctrine. The term Dukkha has different meanings and is neither pessimistic nor optimistic. Dukkha may mean disappointment, desires, cravings, bereavement, unfulfillment, or dissatisfaction. Buddha Dharma does not teach that everything is suffering. What Buddhism does say is that life, by its nature, is difficult, flawed, and imperfect. [...] That's the nature of life, and that's the First Noble Truth. From the Buddhist point of view, this is not a judgement of life's joys and sorrows; this is a simple, down-to-earth, matter-of-fact description. Buddhism is antithetical to much of Confucian philosophy. Due to the focus on social roles as the source of ethical obligation in Confucianism compared to the inherent nonconformity of Buddhism, there was a sustained ethical critique of Buddhism in early Confucianism. While Buddhism entails the belief there is nothing rightfully considered the self, Confucianism emphasized the self a great deal in their doctrines of self-development and our societal roles. As a consequence Buddhism was considered by many to be nihilistic. Sam Harris, a prominent proponent of New Atheism and practitioner of Buddhist meditation, claims that many practitioners of Buddhism improperly treat it as a religion, criticizes their beliefs as "naive, petitionary, and superstitious," and claims that such beliefs impede the spread of Buddhist principles. Similar critiques by figures such as Stephen Batchelor have been offered and subsequently criticized by others who point out that many of the supernatural elements of Buddhism come directly from the teachings of the Buddha himself, and that separating some doctrines from the others is no longer presenting a coherent version of Buddhism. Campbell, June (2002). Traveller in Space: Gender, Identity and Tibetan Buddhism. Continuum International Publishing Group. ISBN 0-8264-5719-3. ↑ "Women In Buddhism Part IV by Rev. Patti Nakai". Retrieved 25 April 2015. ↑ "The Enlightenment of Women". Retrieved 25 April 2015. ↑ Ananda Abeysekara, "The Saffron Army, Violence, Terror(ism): Buddhism, Identity, and Difference in Sri Lanka". Numen 48.1 (2001). ↑ Thomas Banchoff; Robert Wuthnow (2011). Religion and the Global Politics of Human Rights. Oxford: Oxford University Press. p. 178. ISBN 9780199841035. Retrieved 17 June 2015. ↑ Anuradha Sharma Pujari; Vishal Arora (1 May 2014). "Nirvanaless: Asian Buddhism's growing fundamentalist streak". washingtonpost.com. The Washington Post. Retrieved 19 June 2015. ↑ Jerryson, Michael (2010). Buddhist Warfare. New York: Oxford University Press. p. 24. ISBN 978-0-19-539483-2. ↑ "Buddhism and Nietzsche". Retrieved 25 April 2015. 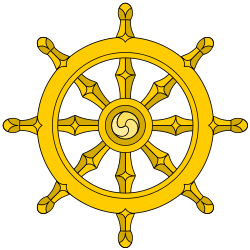 ↑ "BBC - Religions - Buddhism: The Four Noble Truths". Retrieved 25 April 2015. Baskind, James; Bowring, Richard (2015). The Myōtei Dialogues: A Japanese Christian Critique of Native Traditions. BRILL. ISBN 978-90-04-30729-2.